In the nation's capital, supporters of LGBT rights mobilized for marches and rallies Sunday, celebrating their gains but angered over threats to those advances. Leaders of those groups have been embittered by several actions of President Donald Trump's administration, including the rollback of federal guidance advising school districts to let transgender students use the bathrooms and locker rooms of their choice. The activists also complained Trump, although he campaigned as a potential ally of gays and lesbians, has stocked his administration with many foes of LGBT-rights advances, including Vice President Mike Pence, Attorney General Jeff Sessions, and Health and Human Services Secretary Tom Price. Protesters forced the Capital Pride parade onto a different route Saturday afternoon, as the official events of a political, pride-filled weekend kicked off in D.C. The protesters stopped the parade at 15th and P streets before 6 p.m. In a press release, a group called No Justice, No Pride claimed credit. The protesters were wearing shirts that read "Say Their Names" as they appeared with "No Pride" banner before the D.C. police branch that includes the special liason to the gay community. On a loudspeaker, one protester shouted, "We are here today because Capital Pride refuses to end their dangerous relationship with the police, to stop supporting Wells Fargo." A group of protestors forced the Capital Pride Parade to take a different route Saturday. News4's Darcy Spencer reports. The press release says the group opposes Capital Pride sponsors including Wells Fargo and Northrop Grumman. 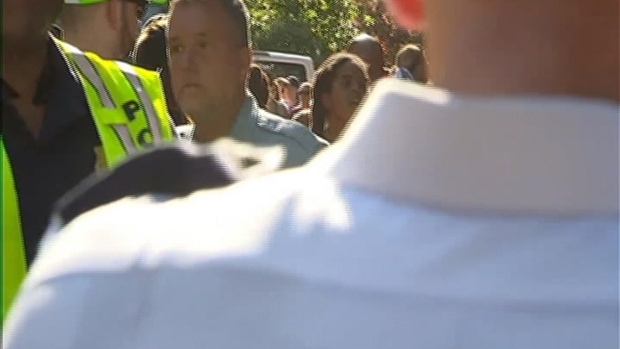 Police Chief Peter Newsham said the protest had been anticipated. "We had an anticipated demonstration here on the street and so we had a plan to reroute the parade," Newsham said. "Everybody is still having a very good time, the crowd has been very cooperative." 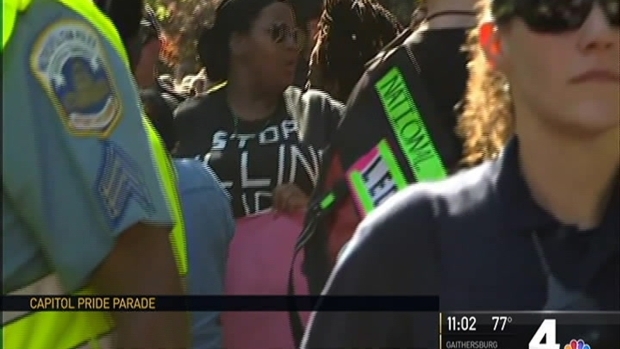 Protesters blocked the Capital Pride parade Saturday. Organizers had anticipated a protest, and moved the parade onto a new route. The parade rerouted to 16th Street to avoid the protest. Cathy Renna, of the Capital Pride, said the parade organizers have had a series of conversations over several weeks with the protesters. "It's unfortunate that we've got several hundred thousand people that are now not able to see the parade unless they are moved by the police, which kind of breaks my heart," Renna said. "We are all here as those who are willing to get in the streets for our community," she said. "I just don't know that doing it against our own community is a productive way to go." Late Saturday, Capital Pride issued a statement that said, "We encourage a robust, civil, and healthy conversation within the community about all of the issues that impact us and look forward to having a mutually respectful conversation in the days, weeks, and months ahead." The Capital Pride parade is one of the biggest events of Pride weekend. This year, the theme of Saturday's parade and Sunday's festival is "Unapologetically Proud." And on Sunday, participants in the Equality March for Unity and Pride will take their voices past the White House and to the National Mall. Capital Pride and the march aren't officially affiliated, but they support each other and have worked together so that participants in one can join the other. The Capital Pride Festival will take over Pennsylvania Avenue this Sunday, bringing live music and dance performances to three stages. Miley Cyrus, Tinashe, the Pointer Sisters and VASSY will headline at the Capitol Concert Stage in front of the U.S. Capitol. Attendees can explore 300 exhibitors, including restaurants and food vendors, local businesses and community groups, national sponsors and more. You can also check out the Family and Educational Activity Area and Fun Zone. The street festival will run noon to 7 p.m., with the concert set for 2 to 8 p.m.; a sunset dance party will happen 8 to 10 p.m. See complete schedules here. While attendance is free for the public, the Capital Pride Alliance encourages donations. For those who want an enhanced festival experience, tickets are available online. The VIP Festival Experience is $200 with an $11.50 service fee, and the Pride Concert Pit Pass for all ages is $35 with a $3.26 service fee. The Pride Concert Pit Pass (Beverage Garden) tickets are currently unavailable. Pets are requested to stay home due to large crowds and the hot weather that's expected. Capital Pride Alliance recommends bringing refillable water bottles and sunscreen. The march aims to address the current political climate and voice concerns of the LGBTQ+ community, organizers say. The march is not directly affiliated with the Celebration of Pride, but the Capital Pride Alliance supports it. Participants will start lining up at 9 a.m. on I Street NW between 14th and 17th streets, with the march set to begin at 10 a.m. Marchers will start off down 17th Street and will pass the White House before ending at the National Mall at 3rd Street and Madison Drive NW. You can see the march route here. The march will happen a day before the one-year mark of the horrific mass shooting at Pulse nightclub in Orlando, planners noted in a release Thursday. They say the march aims "to honor the victims and uplift the resilience of the Orlando LGBTQ+ community during the march and rally." In addition, the Sacred Cloth project-Section 93 will lead the march with their Rainbow25 Sea to Sea flag, and the Gay Men's Chorus of Washington (GMCW) will partner with members of other GALA choruses (Gay and Lesbian Association of Choruses) from around the country to form a festival chorus known as L.O.V.E. : League of Voices for Equality. 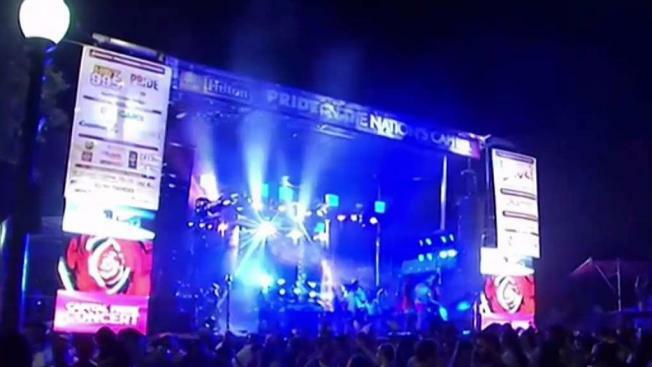 NBC Washington is a partner of Capital Pride.